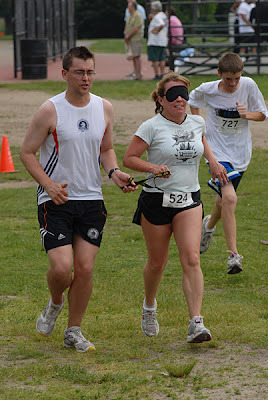 Here's an interesting idea to help people appreciate the challenges of being blind - a blindfolded 5k! Check out this great article from Maine Today about the Vision 5k in Boston, MA, a national championship race with the added option of the "Blindfold Challenge" that lets sighted runners simulate a blind running experience with blindfolds and guides. "I was very nervous beforehand, and it was a little bit surreal, disorienting and dizzying -- but surprising how quickly you get used to it," said Karu, whose previous experience running blindfolded was limited to a lap around a track a couple of weeks before. Very cool! 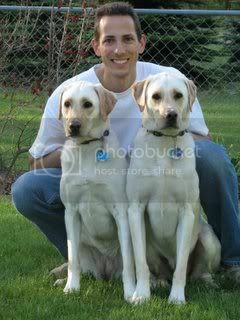 I once ran a half-mile on a sidewalk with my eyes closed using the grass either side of the concrete as my guide. It was unnerving at first but I managed to gain some confidence after a few minutes. My soon-to-be sister-in-law volunteers as a guide for Ski For Light, an experience she really enjoys. How do you find all of these interesting running stories? That i amazing because I tried it for a minute and it still felt uncomfortable.